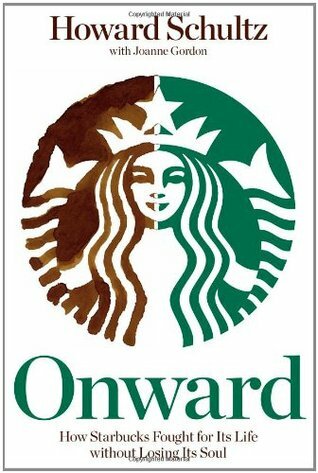 n 2008, Howard Schultz, the president and chairman of Starbucks, made the unprecedented decision to return as the CEO eight years after he stepped down from daily oversight of the company and became chairman. Concerned that Starbucks had lost its way, Schultz was determined to help it return to its core values and restore not only its financial health, but also its soul. 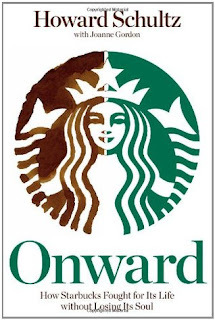 InOnward, he shares the remarkable story of his return and the company's ongoing transformation under his leadership, revealing how, during one of the most tumultuous economic times in history, Starbucks again achieved profitability and sustainability without sacrificing humanity. Offering readers a snapshot of a moment in history that left no company unscathed, the book zooms in to show, in riveting detail, how one company struggled and recreated itself in the midst of it all. The fastpaced narrative is driven by day-to-day tension as conflicts arise and lets readers into Schultz's psyche as he comes to terms with his limitations and evolving leadership style. Onward is a compelling, candid narrative documenting the maturing of a brand as well as a businessman. Review: I really wanted to read this book because of my interest in Starbucks. I was aware of the day that all the Starbucks closed so that staff nationwide could have training and what a bold move this was for such a massive company with as big a following as it has. I have read other books about Starbucks before and so I was keen to hear from the man himself-Howard Schultz-about his take on Starbucks past, present and future. This book is not necessarily a history of Starbucks and is definitely more suited towards people who want to learn the business side of the company than someone like me who is just a fan of what they do. But it was definitely interesting from a customer point of view, the moves they made within the company and the effect it had on me as one of their customers. I could see the new things that had been brought in, I remembered them hitting the market and the reasoning and research behind them being brought in was interesting to read about. What I also found interesting was the fact that this book does focus on the Starbucks right now and the Starbucks of the future, having read in other books and researched on the history of Starbucks in general. It was quite eye-opening to see Howard Schultz's take on where he sees the company going. What really came across was just how passionate he is about his company and how he translates that in everyday business. I think that anyone who sees Starbucks as a faceless corporation would definitely question that view when they read this. Obviously this was a few years ago now and so I would love to see an updated version come out or another book from Schultz because I found this to be an absolutely fascinating read!